PMBComment | Some naive intellectuals in the region - and many "experts" in DC - are prone to make statements like "Latin America is finally free of militarism", or "it is unacceptable to have the military involved in political matters". But I am sorry to say - once again - when it comes to Venezuela, it is the Military, stupid - and NOT much more. 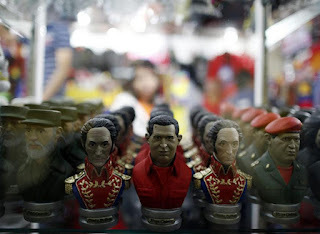 After all, over the last 13 years - and in plain sight of the ENTIRE world - Hugo Chavez has militarized the government and society and fully politicized the military. No solution exists in Venezuela which does not require focusing on the reaction of the fragmented, corrupted and operatically challenged armed forces. This applies to Hugo Chavez's ability to continue governing or HenriqueLeopoldoPabloMariaDiego being able to assume power after an eventual and uphill victory in October. Chavez dedicates 24/7/365 to military fine tuning, and has by now convinced the many factions within the armed forces (too many to enumerate) that they are so complicit in the royal mess that defines the Bolivarian regime that they are much better off putting aside their differences, covering their noses, closing their eyes and swearing allegiance to him or a chavista successor to him. And that seems to be the sorry fact of life in Venezuela today. So, ignore the military at your own peril. I have written much about this subject since 2002 (do a search at www.pmbcomments.com) and have finally began to observe more and more people understanding that military matters matter a lot in today's and tomorrow's Venezuela. It might be a bit late, but recognizing this mega fact is a big improvement. Demilitarizing Venezuela is - and will be for decades - a massive undertaking for all Venezuelans (me firmly included) who want to see the military out of politics, out of the nations' civil service jobs, out of the narcotics business, free of their subservience to Cuban generals, and focused on ensuring peace and helping preserve the rule of law while millions of civilians focus on rebuilding a country decimated with the complicity of many men and women in uniform. All this sounds like wishful thinking, does it not? El primer mandatario, Hugo Chávez, se refirió este jueves a las criticas por parte de la oposición en relación a la Fuerza Armada Bolivariana. “La oposición ha dicho que hay que limpiar a las Fanb del chavismo”,señaló. “Tendrán que acabar la Fuerza Armada, porque la Fuerza Armada es chavista”, ponderó el Presidente. “La Fuerza Armada venezolana tiene a Chávez en el corazón, en la raíz”. El Jefe de Estado se preguntó “cómo van a hacer para limpiar a la FAN del chavismo, del bolivarianismo, no podrán, no podrán porque Chávez tiene en el corazón y en el alma a la Fuerza Armada.